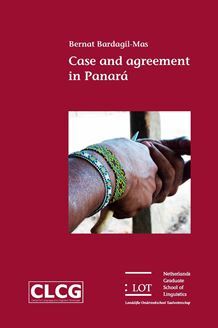 This book provides an in-depth account of the morphosyntax of case and agreement in Panará, a language of the Jê family. Panará is spoken by 500-600 people currently living in four villages in the Panará Indigenous Land, located between the states of Mato Grosso and Pará, in central Brazil. On the one hand, Panará presents some typically Jê traits: the lexical correspondences, phonemic inventories, phonological processes and general morphological profile all have the characteristics that one would expect in any Jê language. On the other hand, the constituent order, case marking patterns and verbal morphology are radically different from what we find elsewhere in the Jê family. The present dissertation contains a thorough description of the phenomena at hand, as well as to discuss their place in current linguistic theory.